Superbly situated in the heart of the historic county town of Shrewsbury, this beautiful house enjoys a prime location within walking distance of Prestfelde Prep School, Shrewsbury High School, The Square and the historic Old Market Hall. The property is ideally situated to take advantage of the vibrant town centre with the many restaurants, cafes and boutique shopping opportunities. Local land marks include St Chads, The Quarry; which hosts many events including the annual Shrewsbury Flower Show; and the Theatre Severn. Excellent transport links also provide access for the Shrewsbury bypass with M54 link to the West Midlands. 111 Abbey Foregate is an easy house to love with its obvious character, room sizes and versatile layout. 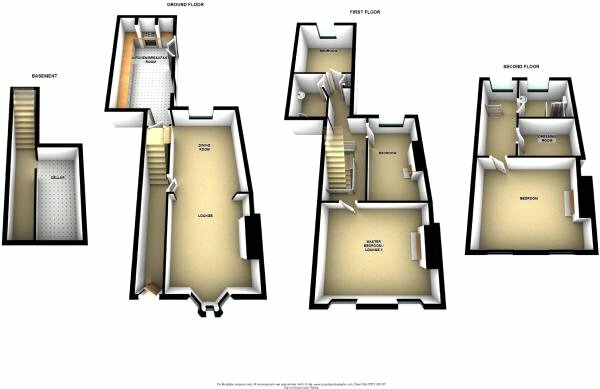 Working from the top floor down, the 2nd floor is home to a master suite with bedroom, walk in wardrobe and shower room. Downstairs to the first floor, you will find three further bedrooms and the family bathroom which services them. All bedrooms would take double beds with the bedroom to the front of the property being significantly bigger than the other two. The ground floor, entered through the front door, has an entrance hallway, open plan living room and dining room as well as a breakfast kitchen to the rear of the property. The kitchen offers double door access to the courtyard garden which is private and enclosed but also providing access to the cellar underneath the property. This provides useful storage. To the front of the property, on street parking is available in bays to the front of the house.